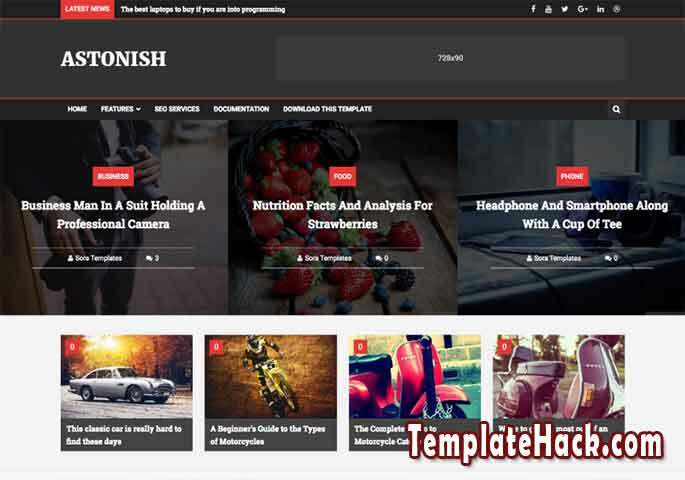 TemplateHack.com - Download Astonish premium blogger template. Astonish is magazine blogger template made with dark base color on first column and white base color on second column. That’s right, this blogspot theme has 2 elegant column. Use this template for your magazine blog, news blog, portal blog, gallery blog, or all of many content blogger niche. It is also will look amazing for applied on food blog, phone blog, business blog, lifestyle blog, travel blog, recipe blog, etc. Just download this great blogger template, premium blogger template for free just for you I’ve share today. Widget ready, Social bookmark ready, SEO Friendly, Dropdown menu, Minimalist, Clean, Page navitaion menu, Red, Tabbed widget, Dark, White. Magazine blogger template, News blogger template, Portal blogger template, Gallery blogger template.